You might say Gunung (Mount) Agung isn't just a mountain on Bali; Bali is an island that just happens to surround and depend on Gunung Agung. 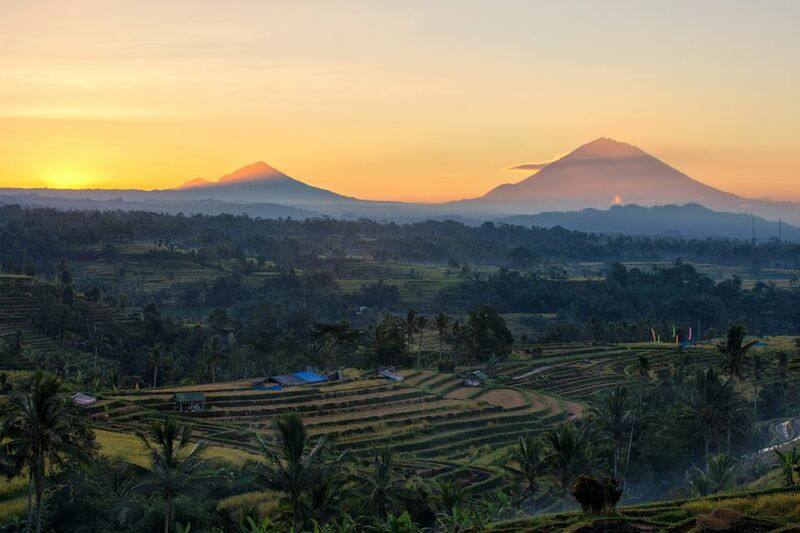 Either way, it's difficult to overstate Gunung Agung's significance to Bali and the Balinese. At over 10,300 feet, the mountain influences the island's climate by blocking the passage of airborne moisture from west to east. The terrain east of Gunung Agung is arid as a result. For the Bali Bound: Want to know more about the rest of the island? Read about Bali's Regions & Beaches, Decoded. Gunung Agung itself is considered Bali's most sacred point: every building points towards the summit, and every temple and altar faces the temple Pura Besakih on Gunung Agung's slopes that stands as Bali's most sacred temple among the many on the island. As with the holiest-of-holies, the Balinese believe the temple is nothing short of miraculous. Gunung Agung last erupted in February of 1963. To go by Balinese superstition, this was because an important once-a-century ceremony was performed incorrectly. Over 1,500 lives were lost in the wake of the initial eruption, killing even more when a secondary eruption took place later in the year. The eruption also blew off the top 400 feet of the mountain, and caused more vivid-than-usual sunsets as far away as Europe and the Americas. Miraculously, Pura Besakih was left unharmed by the violent eruption. Locals claimed that the lava flow came close to the temple – within yards at their closest – but left the temple itself undamaged. With a midnight start and an arduous 7-hour uphill trek before them, climbers considering an ascent up Gunung Agung would be right to treat the experience as more than a casual uphill jaunt. Among the volcanoes in Indonesia you can explore on foot, Agung is certainly part of the tougher half of the list. The other major volcano on Bali worth climbing is Mount Batur in Kintamani – its two-hour trek is chickenfeed compared to Gunung Agung's. Many Gunung Agung trekkers book a stay at the sleepy East Bali town of Sidemen, where you can find the best selection of hotels and homestays nearest the trail. If you value a shorter trek over creature comforts, you can choose the town of Selat instead, cutting about 15-20 minutes off your trek. Gunung Agung is located in the Karangasem district of East Bali about an hour from Ubud - Bali's cultural hub. Numerous travel agencies around Ubud advertise transportation to Pura Besakih. Your accommodation can also arrange a private driver if you wish to make your own way to Gunung Agung without a tour. Gunung Agung can also be accessed via the Kintamani region by driving south one hour toward Rendang. Tourists can take one of two major approaches up Gunung Agung. The difficult Besakih approach begins about half a mile from the Pura Besakih temple, and leads to the western peak, the absolute summit of Gunung Agung standing at 9,944 feet above sea level. While this route is more difficult, it also ends with a spectacular view of Bali from all around. The easier (but by no means easy) approach begins at Pura Pasar Agung (the highest temple in Bali), and terminates at the crater rim, an elevation just 300 feet short of the absolute summit with views of the 2,300-foot wide crater and panoramic views of southern and eastern Bali. You can actually begin from the second route and divert to the first mid-way during the dry season, as a connecting path between the two opens up then. Time your climb right, and you'll reach the summit to find an unforgettable sunrise and views that encompass most of Bali. Even Lombok's Gunung Rinjani on Lombok is visible from the very top! You'll have to be down before 9am, though, as the clouds begin to roll in by 9am. Both routes may be closed off during high holy days, so check with locals first before arranging your trip. You'll need no real climbing equipment to summit Gunung Agung, but the unpredictable weather and rough climbing conditions require some commonsense preparation before you go. Bring the following items with you when considering a climb. Cold Weather Jacket: Temperatures in the morning are extremely chilly; the wind is strong on the exposed summit. Waterproof Gear: Gunung Agung influences the whole climate in Bali. Be prepared for unexpected rain even during the dry season. Sun Protection: After a teeth-chattering wait for sunrise, the sun appears in full force and temperatures rise quickly. Take a hat and sun protection. Read about how to protect yourself from sunburn in Southeast Asia. Proper Shoes: The volcanic rock will make short work of sandals and exposed toes. Take proper closed-toe climbing shoes on your climb; you'll need footwear with plenty of grip to handle the slippery mud and bare rocks along the way. Water: Once you begin the climb, there will be no water available along the way. Bring at least two liters of water, you'll need all of it for the ascent and return trip. Food and Snacks: Overpriced and low quality, the tourist-targeted food near Pura Besakih is not the best example of Indonesian food. Take your own high-energy snacks to replace calories burned on the ascent. Flashlight: Navigating the trail before dawn is impossible without a flashlight, and getting lost without one would turn your adventure into a nightmare. Bring a headlamp; you'll need your hands free to negotiate the rocky part of the ascent. Guides are required, but spotty enforcement means that this rule is often ignored by travelers. If you value your safety, you will certainly get a guide to lead you up to the summit. You can hire guides at either Besakih or Pura Pasar Agung, but the smart money is on hiring guides before the actual climb date; both Sidemen and Selat towns offer guide services up Agung. Expect to pay about $50-$80 per guide for their services. The tour usually includes breakfast at the summit, usually a light pancake repast. Before you Go: Find out How to Prepare for your Southeast Asia Trip. The Bali dry months between April and October offer your best shot at having a pleasurable climbing experience up Gunung Agung. During the wet months from November to March, the paths become more slippery due to the rains, and dangerous mudslides are known to happen. What Are the Most Fascinating Places to See in East Bali? Is it Safe to Climb Active Volcanoes in Indonesia?